Video evidence that lightning safety tips work! As we near secondary severe weather season in the south (November-early January), I ran across the following videos that prove lightning safety tips DO work and should be heeded as thunderstorms (not necessarily even severe storms) approach. The first proves that the Faraday Cage that is a vehicle is a safe place to shelter during storms (caveat: cars are not the safest places to be during high wind or possible tornadoes). Check out the SUV struck by lightning and the results! The NWS mantra regarding lightning safety is "when thunder roars, go indoors!" It was proven again earlier this summer at a NASCAR event in Pocono, PA when a fan was killed after being struck by lightning, while he was standing next to his car! His safe place was literally right next to him. This is simply inexcusable! Learn more about lightning safety on this NWS website (or http://www.lightningsafety.noaa.gov/overview.htm). You can also read a series of myths/truths related to lightning here (http://www.lightningsafety.noaa.gov/myths.htm). Thanks to the folks at Watts Up With That for posting the "Lightning vs. SUV" video on their site. Another round of summer - how long will it last? A brief shot of summer has returned to the Memphis metro thanks to an area of high pressure located to our east. The southerly winds to the west of this area of high pressure pushed a warm front through the metro earlier this week bringing warm and humid conditions from the Gulf Coast up into our area. Highs in the warm sector south of the front are in the 80s to near 90 with dewpoints in the 60s. With the warm front stalled out to the north of our area as a stationary front, upper-level disturbances sliding along this boundary are producing areas of showers and thunderstorms to our north moving from west to east near the front. Some of these storms in the warm sector are strong to marginally severe with wind and hail. Most of these should stay just to our north for the next 24-36 hours. 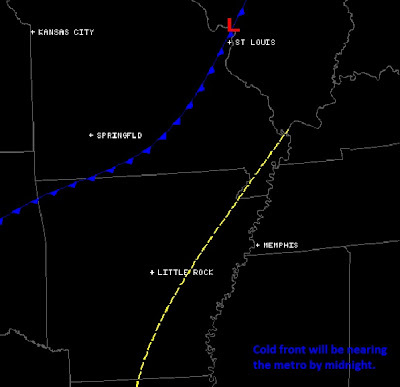 Stationary front is well to our north, leaving the Mid-South in the warm sector. Disturbances have triggered storms that will move by to our north. Radar/frontal positions as of Weds afternoon. Blue boxes are a t'storm watch. As the front slowly sinks south over the next couple of days, it will move close enough to the metro by Friday morning that rain chances will return as disturbances continue to move along the front. As these disturbances pass through the area, scattered showers and thunderstorms will develop and affect the metro. The front will remain draped across the area into Saturday, meaning rain chances continue for the first half of the weekend before the front finally pushes farther south, taking the rain chances with it. High temperatures will return to the upper 70s and lower 80s with less humid and dry conditions behind the front for the end of the weekend and into the beginning of next week - another return of more autumn-like weather! I wanted to share the image below for a couple of reasons. If you aren't familiar with it, this is a "full disk" satellite image. GOES (or geo-synchronous orbiting satellites) orbit the Earth in one spot (hence their orbits are synchronized with the rotation of the Earth) at an altitude of 22,500 miles. They not only take sectorized images of portions of the Earth on routine basis, but every 3 hours (typically), they take one gigantic picture of the entire Earth - a full disk image. The full-disk image below was taken by GOES-14 at 12:45pm CDT today. Why is this important? Because ordinarily it wouldn't have taken it. 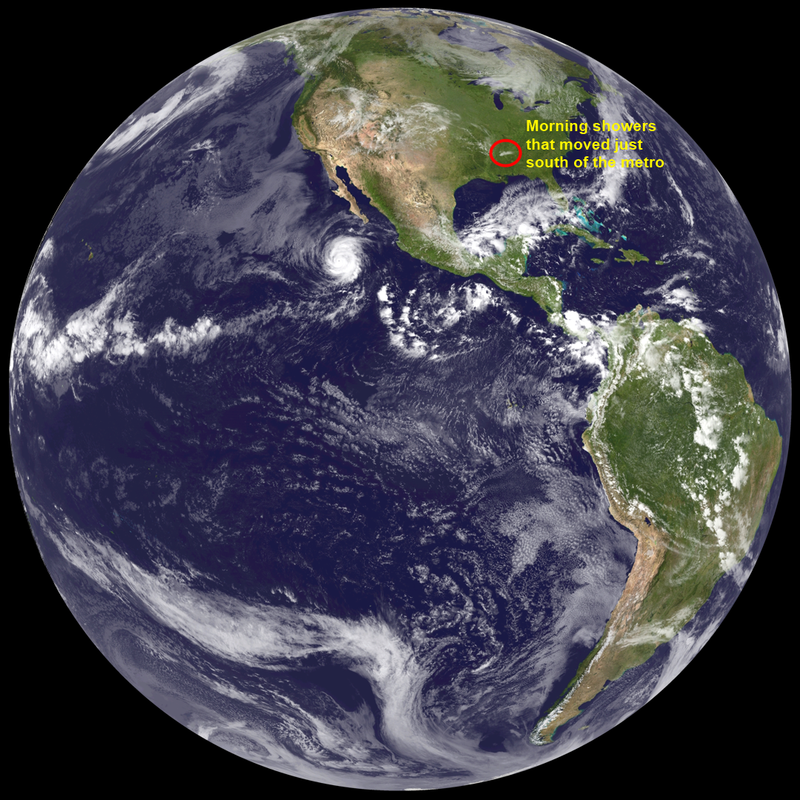 The satellite that would normally take this picture, GOES-13 (or GOES-East, covering the eastern U.S. and Atlantic), went belly-up yesterday! For over 18 hours, meteorologists were left scrounging for occasional and partial images of the eastern U.S. from other satellites. Finally, at 12:45pm, GOES-14 was awaken out of "standby" mode by NOAA satellite engineers in the U.S. to provide backup (mutual aid as firefighters might call it) so they could figure out what was going on with GOES-13. The image below was the first provided by the backup satellite. The other interesting thing about this picture is circled and labelled. If you ever wondered how minuscule we and our local weather are compared to, well, the entire globe, look closely at this image. A little speck of white (circled in red) was our morning cloud cover and showers and thunderstorms that passed by just to our southwest, from east-central AR into northwest MS. In the grand scheme of this image, they're nothing. To those in AR who received hail, lightning and thunder, and heavy rain, they were disruptive. Now pretend you're a computer model and this is one of your inputs. What forecast do you produce for Memphis, TN? Typically a very accurate one, which I find simply stunning! Click the image for a large view and check out the detail - again, from 22,500 miles in the sky! 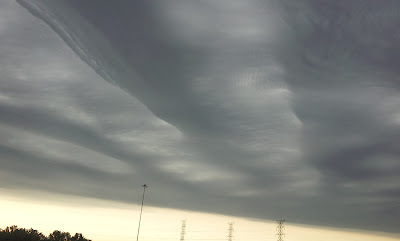 MWN meteorologist Erik Proseus took the pics below of some fascinating clouds that occurred behind an outflow boundary that moved through the area this morning. 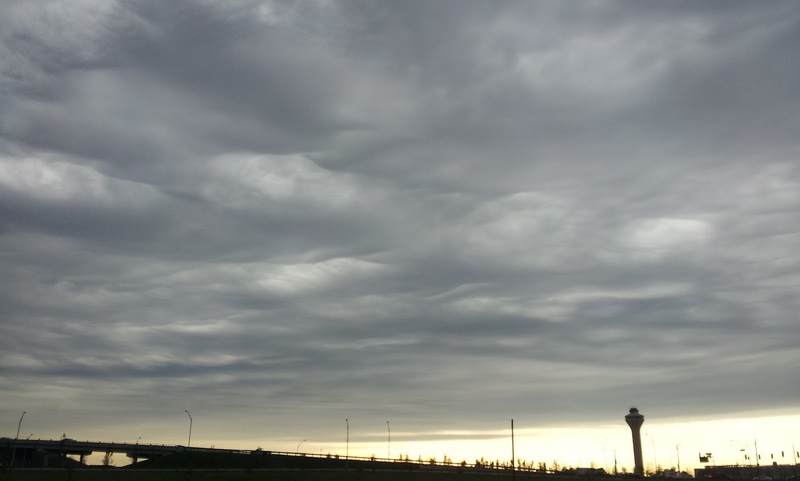 The waves in the clouds were likely formed as the outflow disturbed the wind flow in a stable atmospheric layer, creating some very interesting patterns in the sky! Following these clouds, showers & a few thunderstorms moved through. Since the storms were elevated in nature (the rising air of convection was located above the stable layer at the ground), the cloud bases were high enough to see some pretty nice lighting strikes. No pics of those though! All pics copyright 2012, Cirrus Weather Solutions/Erik Proseus. 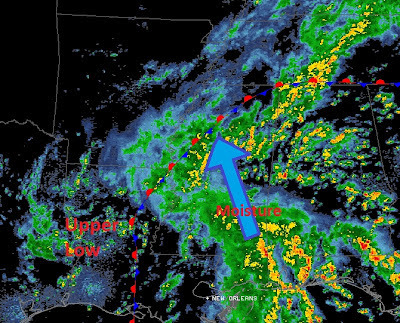 For the first time in several months, the Mid-South is seeing steady rainfall across the entire area thanks to a stationary front that has been stretched just to the south of the metro. Moisture continues to ride over this boundary, pulled north by an upper-level low over Louisiana, producing widespread light rainfall across the area. Steady light to moderate rain will continue through the evening rush hour and into the nighttime hours until the front is finally pushed to the east by a strong cold front that will move through the metro towards morning, bringing a end to our rain chances. 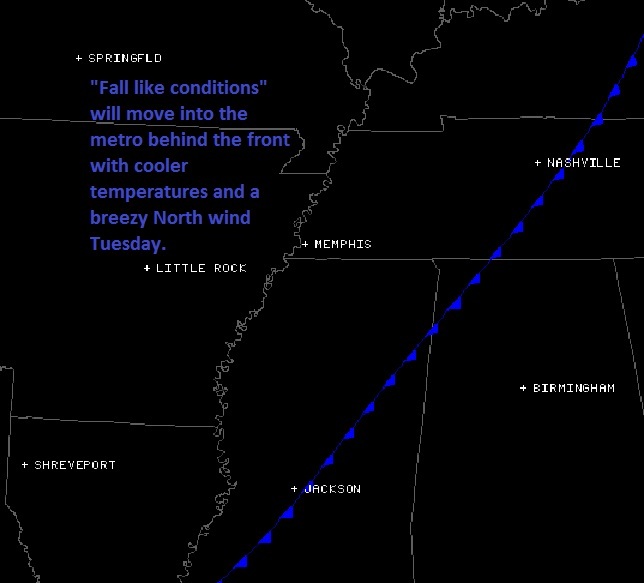 On Tuesday, the front will be south of the metro leaving behind cooler conditions with a more fall-like feel! 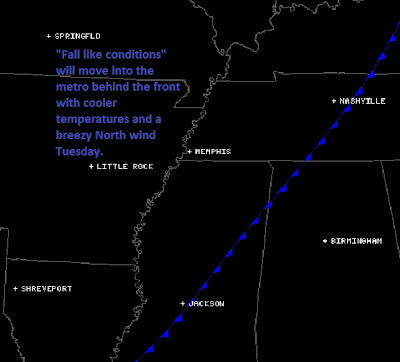 The winds Tuesday will be gusty from the north, pushing the colder air into the area, with lows in the 40s expected Tuesday night outside the urban heat island. For the rest of the work week, highs will warm from the mid 70s to the lower 80s with a dry north wind keeping dew points low. Expect overnight lows in the city to drop into the 50s each night with a few more 40s likely in cooler outlying areas on Thursday morning. 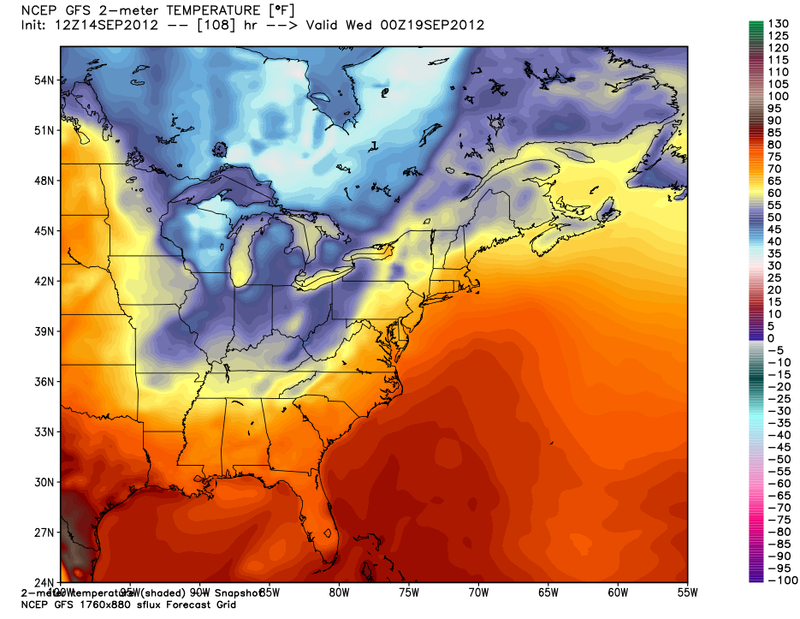 Another shot of reinforcing cool air will arrive with a front on Saturday. Very little rain is expected with this front due to the dry air ahead of it behind tonight's cold front, but it will drop highs back into the 70s next weekend. With the Mid-South transitioning to a more fall-like pattern, we have likely seen the end of our 90 degree days for the year. View the detailed MWN Forecast here. 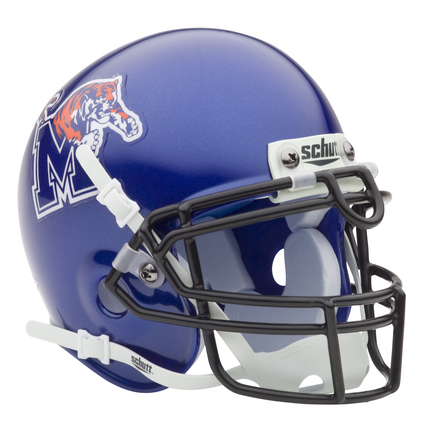 The changing seasons - will Memphis see 90 again in 2012? Finally! It seems like more comfortable weather has made an appearance this week in the Mid-South following another summer that seemed like it would never end. 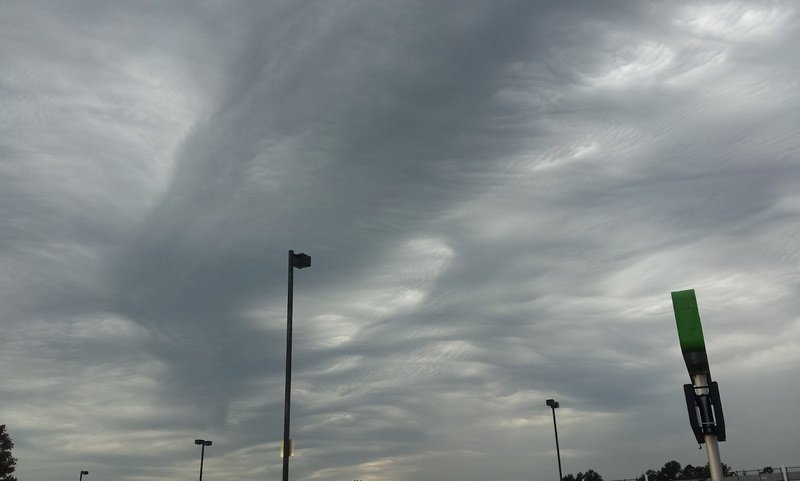 The passage of Isaac over Arkansas seemed to be the "event" that signaled the end of a hot, dry summer and more temperate conditions, lower humidity, and more frequent showers and storms since the first of September. In fact, since September 1, most of the metro has seen an improvement in drought conditions (especially short-term) after a two-month stay in the "Extreme Drought" category. 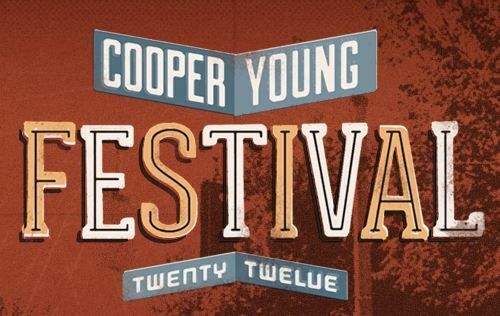 As we head into a busy early fall weekend, many have asked what the weather will bring for football, Cooper Young Festival, and other activities. A weak cold front moves over the region today and lingers through the weekend, however the rain chances are not high with this front. As it moves in today, we'll see a few scattered showers this afternoon - support for thunder is minimal. Most of these should be done in time for Friday night high school football games this evening with comfortable, if slightly humid, weather. These conditions continue tomorrow with highs again in the 80s, moderate humidity, and a slight chance of showers. No washouts are predicted. Once again, any showers should end by evening in time for Memphis Tigers football at Liberty Bowl Stadium (GO TIGERS!). Conditions will be MUCH improved over the first home game of the year 2 weekends ago when severe storms caused a 2 1/2+ hour lightning delay! By Sunday, we'll see some upper level energy move into the area, especially by evening, supporting higher rain chances as the front moves back into the picture. Right now, rain chances are 50/50 Sunday and Sunday night. Highs remain in the 80s Sunday and Monday. On Monday night, a REAL cold front moves through, bringing a round of showers and possible thunderstorms, then another blast of fall weather for the middle of next week! We're talking highs in the 70s, lows in the 50s, and much reduced humidity! Click here for the complete MWN Forecast. Tuesday 7pm (9/18/12) forecast temps from the GFS model. Yellow is lower 60s. Check out the 40s/50s to our north! So, the other question people are beginning to ask is, "will we see 90 degrees again this year?" I have to say, it is looking doubtful. As average highs drop into the mid 80s, there are no 90-degree highs in the forecast, and a cooler pattern looks to take hold by the middle of next week, I believe that we're done with the 90s for 2012! Certainly I can't completely rule out a 90-degree reading between fronts for another few weeks, but the likelihood seems low. Below is the 8-14 day outlook from NOAA which shows a high probability of below normal temperatures for the period September 21-27. We'll take it! How about you? Are you ready for fall? Autumn weather on the weekend menu! After suffering through a seemingly-unending summer, Mid-Southerners should be licking their chops over a gorgeous fall-like forecast that begins this weekend and extends into next week. The abrupt weather change is due to the first true Canadian front of the year pushing through the region. As one might expect with temperatures in the mid 90s ahead of the front, it could be a little rough making the transition and indeed the Storm Prediction Center believes so as well. 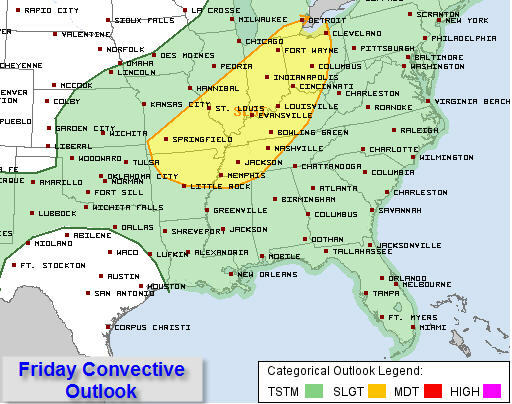 The (UPDATED) Friday convective outlook puts the Memphis metro near the southern edge of a slight risk zone for the possibility of severe thunderstorms (see map below). We'll have to get through one more hot day first though as these storms will hold off until after dark tonight. Highs in the upper 90s and heat indices near 105 are expected again ahead of the front. As the cold front moves through (likely between 9pm and midnight) a line of storms is expected. Some of these storms could be severe, especially to the north and west of Memphis, with damaging wind and severe hail the main threats. Behind the storm line, showers and embedded non-severe thundershowers are expected to continue overnight, bringing as much as 1-2" of rain to the metro. Projected rainfall totals Friday and Friday night. 1-2" is possible across most of the local area. By Saturday, most of the rain will be gone, clouds will move out in the morning, and a brisk north wind will feed in cool air, causing highs to remain in the 70s on Saturday! Sunday will be just as nice, and even cooler in the morning, with lows in the 50s area-wide (including in the city of Memphis) and highs generally near 80. A slight warming trend will be expected next week, but we'll see lots of sunshine with no rain in the MWN Forecast. Plan to get out and take care of the outdoor chores that have been neglected, and perhaps even head over to the Germantown Fest for what should be a GREAT festival weekend! As always, MWN will nowcast the storms that affect the area tonight on our social media feeds linked below. 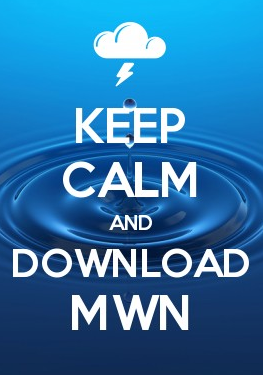 Also, since severe weather is possible after dark, it would be a good time to download the MWN mobile app for iPhones or Android devices (link below) and activate StormWatch+ so that you can be alerted to any severe weather - but ONLY if it is going to impact your location! While I may not know where you live, StormWatch+ does! Though still above normal temperature-wise, August started to see the yearlong heat spell relax just a bit. For the year, the average temperature in Memphis continues to be the warmest on record. Through August 31st, the average temperature for 2012 of 69.2 degrees was 4.2 degrees above normal, beating the previous record though the end of August by about 2 degrees (2006, +1.9 degrees). Precipitation was also below normal, but only slightly, as a few thunderstorm complexes managed to drop a fair amount of rain from time to time. Drought conditions remain unchanged from the end of July with the metro now classified as being in an extreme drought. The average temperature for the month of August was 82.7 degrees, or 0.7 degrees above normal. The average high temperature was 92.7 degrees and the average low was 72.7. The coolest temperature of the month was 64 degrees on the 21st, while the highest temperature was 99 degrees on the 8th. There were 23 days in which the high reached 90 degrees or higher. Precipitation for the month totaled 2.64", which was 0.24" below average. There were 8 calendar days with measurable rainfall, but only 3 with more than 0.50" (maximum 0.92" on the 3rd). The peak wind gust was 38 mph from the northwest on the 13th with an average wind speed for the month of 7.3 mph. Click here for a daily statistical recap for Memphis International Airport. 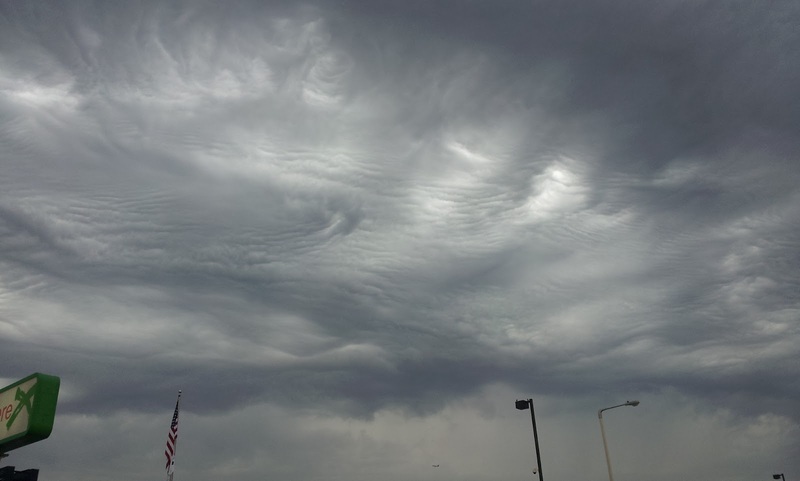 The average August temperature at Cirrus Weather Solutions was 79.8 degrees with a maximum of 98.1 degrees on the 8th and a minimum of 55.3 degrees on the 12th, following a mid-month cold front that dropped dewpoints enough to allow a few cool mornings. August precipitation measured 2.62" via the automated gauge and 2.69" in a manual gauge used for the CoCoRaHS program. The measured peak wind gust was 21 mph on the 30th. Average relative humidity was a muggy 70%. Click here for a daily recap on MemphisWeather.net. For the month of August, the average temperature error in all MWN temperature forecasts was 2.62 degrees, lower than all available computer model data and the National Weather Service. Over 56% of the MWN temperature forecasts for the month were within 2 degrees of the actual temperature. MWN's forecasts extend out five periods (2.5 days, or roughly 60 hours). For dewpoint accuracy, the MWN forecast averaged 2.29 degrees of error and fell within 2 degrees of the actual dewpoint two-thirds of the time. Historical accuracy statistics can be found here. As college fans celebrate the arrival of one of the most coveted days of the year - the first Saturday of the college football season - another round of severe weather may be brewing on the horizon. There are at least three games of keen Mid-South interest that could be affected by local weather, so we're putting together this brief blog update as a heads-up. 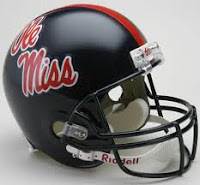 The first game is in Liberty Bowl Memorial Stadium pitting the Memphis Tigers against UT-Martin; the second is in "The Grove" in Oxford, MS, featuring Ole Miss and Central Arkansas. The games each kickoff at 6pm. The game of chief concern weather-wise will be the Memphis/UT-Martin match-up. 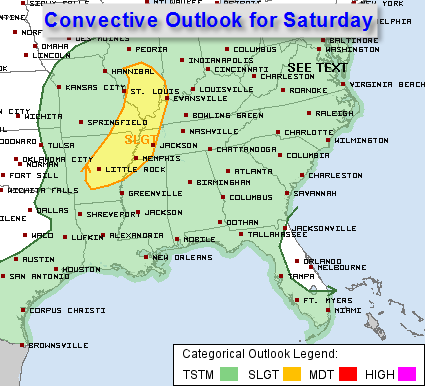 First, a Slight Risk of severe weather has been expanded to include the Memphis metropolitan area (see updated map below). As the remnants of Isaac move east across Missouri towards St. Louis by this evening, dry air on it's south side has brought plenty of breaks in the clouds over the Mid-South and allowing daytime heating to raise the instability in the atmosphere. 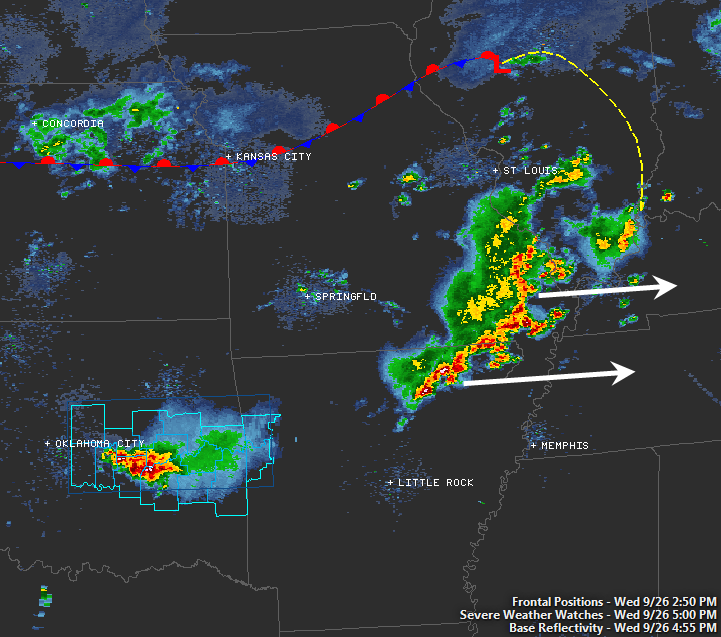 As a lobe of energy rotates around the low in Missouri, it will encounter this unstable airmass and thunderstorms are expected to erupt this afternoon over Arkansas. Most models are now showing a northeast-southwest line of convection firing over central AR by mid-afternoon and pushing southeast towards the metro. One high-resolution model's scenario (the RAP model) plays out in the sequence of images below. 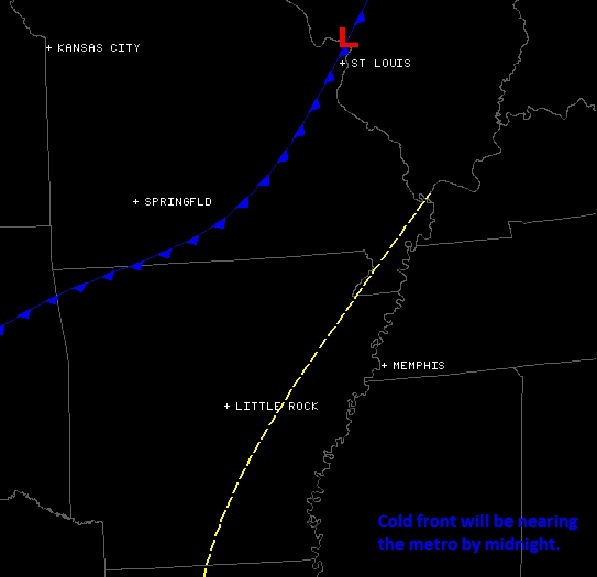 As you can see, the line is just northwest of the city of Memphis by 8pm and moves over the city before 11pm. Like last night, the storms bring the possibility of strong to severe wind (40-60 mph), dangerous lightning, and certainly very heavy rain. Given that most college football games are about 3 hours long, the Memphis game will probably wrap up around 9pm. This could be a very close call! For those attending the game in Oxford, I believe you will get your contest in without too much of a problem. If the line happens to arrive an hour or two early in Memphis, the tail end of the Ole Miss game could be threatened. I don't suspect that will happen. MemphisWeather.net will be nowcasting any and all weather threats throughout the day and evening. Follow us on Facebook and/or Twitter, as well as via our mobile website (http://m.memphisweather.net) or our mobile apps (iPhone / Android). If you activate StormWatch+ on our app, you can even put your seat in the stadium as one of the alert locations using GPS. You'll receive push notifications if a watch or warning is issued for your seat! How's that for personalized service?